Do Birds Hold Funerals? : 13.7: Cosmos And Culture Some birds respond to dead companions in interesting ways. Is it insightful or inappropriately anthropomorphic to conclude that these birds hold funerals? Here's a journal-paper title that grabbed my eye: Western scrub-jay funerals: cacophonous aggregations in response to dead conspecifics. OK, there's some jargon included — "cacophonous aggregations" refers to birds called in by other birds' vocalizations, and "conspecifics" just means other individuals of the same species. But it's the "f" word — funeral — that caught my attention. The paper, published online last week by the journal Animal Behaviour and written by T.L. Iglesias, R. McElreath, and G.L. 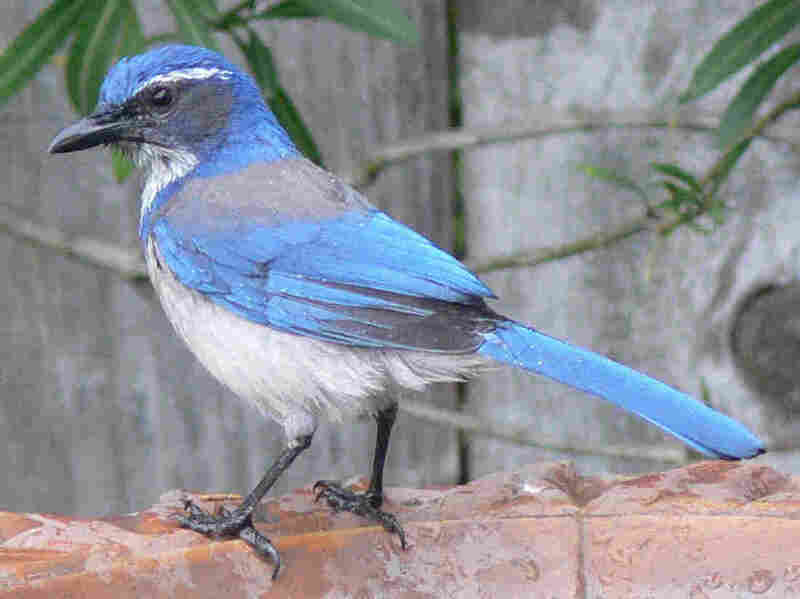 Patricelli at the University of California-Davis, describes a series of fascinating experiments set up to gauge scrub-jays' responses to dead companions. But here's the thing: nowhere in the text does the word "funeral" appear. That term is reserved for the title. So why use the term at all, and do birds really hold funerals? Scientists already knew that some corvids — crows and ravens — make alarm-call vocalizations when they discover the body of another bird. Iglesias et al. wanted to carry out an experimental (rather than only observational) study using a corvid species. So they trained scrub-jays to show up at a feeder at certain times, and then tested the birds' responses to certain situations. For instance, they presented the birds with a novel object made of wood, approximating the form of a dead scrub-jay, and some days later presented them instead with the actual skins (plus feathers) of dead jays. The birds never called or formed cacophonous aggregations in response to the wood object, but they always called at the skins, and almost always these callings escalated into noisy gatherings. In another test, the birds were shown the jay skins and (at different times) mounts of dead great horned owls in a perched position. To both stimuli, jays responded with calls and noisy gatherings at about the same, high rate. Only with the fake owls, though, did the birds carry out mobbing behaviors. "Our results show that, without witnessing the struggle and manner of death, a dead conspecific was used as public information about risk, and that this information was actively shared with conspecifics and used to reduce [by temporarily decreasing foraging in the area] exposure to risk." In other words, the birds tell each other about a dead companion, and so individually and collectively the scrub-jays may learn something about predation risks. By calling in others (the cacophonous aggregations), they may be more likely to drive a predator away or to warn relatives and mates of danger. "I do not wish to imply anything about the occurrence (or absence) of an emotional or cognitive response by using the word 'funeral.' The use of the term in the title is due to the fact that it has been used to describe animal responses to their dead in many other species (crows, magpies, ravens, elephants, chimps ... ) and I wanted to make sure this work could be linked to those anecdotal observations." "I also watched a red fox bury her mate after a cougar had killed him. She gently laid dirt and twigs over his body, stopped, looked to make sure he was all covered, patted down the dirt and twigs with her forepaws, stood silently for a moment, then trotted off, tail down and ears laid back against her head." In my book How Animals Grieve, coming out in April, I detail a host of examples of animal grief and mourning, a few of which relate to this sort of apparently ceremonial context. Iglesias, however, means to use the word "funeral", as she put it to me, "only to the extent that it is an animal paying attention to another dead animal" (though excluding behaviors such as scavenging). Here's the bottom-line question, then: When is the term "funeral" inappropriately anthropomorphic? Iglesias asks, reasonably, that the scientific merit of the paper not be lost in a dust-up around this question. I agree, because her team has told us something really valuable about corvid intelligence and communication. On the other hand, if you put the f-word into an article title, but divorce its meaning from any evidence of care for the body and/or expressed emotion, you'd better be prepared for skepticism.